Unless you live under a rock (and no offense intended if you do), you’re probably aware of the movement to eat food that originates close to home. While this is a growing trend, it is by no means a new idea. Until about a century ago (maybe even less), the vast majority of people survived by consuming almost solely locally produced foods. But new idea or not, more and more people are making an attempt to get at least some of their food from local sources. If it’s something you’re serious about, great; if you couldn’t care less where your food comes from, I’m sorry. To each his own, and if you can’t imagine life in January without those pink balls from Mexico that masquerade as tomatoes, who am I to try to dissuade you? 🙂 But for those of you who are open to ditching that bland, unripened produce from across the country, here are just a few of the benefits of eating locally. There are a number of reasons that we try to source our food from close to home, but one of the biggest is freshness. Food that’s shipped from California, (or Florida, or Mexico, or Chile [side note: do you remember those “It’s summer in Chile” commercials from a few years ago? Chile is almost 6,000 miles away…]) will never, ever surpass the freshness level of something that your farmer picked yesterday. By the time it hits your grocer’s shelves, produce is at least days, and sometimes weeks old, and eggs can be over a month. It just does. As with anything, I know exceptions can be found (and if you’re one of those who just likes to be an antagonist, don’t bother), but as a general rule, if it’s grown locally, produce can be picked when it’s ripe, instead of days earlier (so it can be shipped while still firm), then artificially ripened later. Most varieties of commercially-grown fruits and vegetables were bred and selected exclusively based on how well they handle shipping and storage. Flavor? Not so much. Grow a strawberry plant and pick them when they’re fully red and near-to-bursting with juice, and then pick up a pint from the grocery store, and let me know which one was better. Or a peach. Or tomato. Corn. You get the point. Because fruits and vegetables are allowed to ripen before they’re picked, it gives them a chance for all the goodness to fully develop. And on the flip side, because they get to you sooner, they don’t lose as many nutrients as they would during days of transport and storage. When you go to a typical grocery store, your tomato options are usually “tomatoes,” maybe “grape tomatoes,” perhaps some fancy “on the vine tomatoes,” and… well, that’s about it. When tomato season is in full swing, check out your local farmer’s market. Guarantee you’ll find more than just “tomatoes,” and even if they’re labeled as such, the seller should at least be able to tell you what kind they are. And of course, that goes for more than just tomatoes. Buying local (and this applies to anything, not just food) clearly helps your local economy much more than picking up something at the local chain store. And I don’t know about you, but if given the opportunity, I’d prefer keeping my dollars close to home instead of sending them to some corporate conglomerate hundreds or thousands of miles away. We know many of our local farmers and the work that they put into producing quality product – why not reward that? It encourages them to continue to strive to get better, which continues to provide us with more and better food options. Win-win. You may notice that there might not be as many organic options at a local market, but if you ask, many of those farmers that aren’t labeled actually do use sound organic growing practices, they’re just not “certified organic” because all the red tape involved is cost-prohibitive for someone of their size. If they want to dump herbicides and pesticides on their crops, no big deal, but if you want to go chemical-free, well, I’m sorry, but you’re gonna have to jump through all kinds of hoops (it’s almost like the government wants to make it more difficult to recognize better food options… I know, crazy, right?). And most growers will answer any questions and even let you visit the farms – they’re generally quite passionate, and welcome any opportunity to make that passion known. Eating locally does require some commitment. It means eating seasonally too, so once that first frost hits, no more tomatoes for the next eight or nine months. Our winter menu isn’t very bright, and consists of a lot of meat, potatoes, winter squash, and root vegetables. Come summer, when the garden’s in full swing, we’re borderline vegetarian a lot of the time. 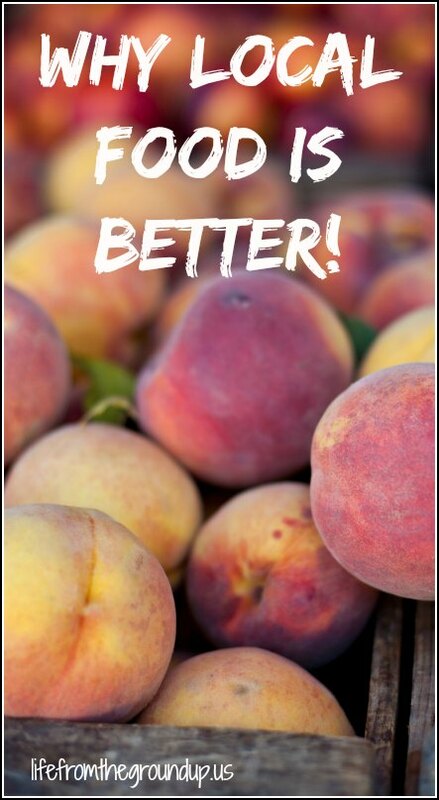 And that’s okay – to me, it’s more fun to binge on tomatoes and strawberries and peaches for the month or two that they’re at their absolute peak than eat a decidedly inferior version year-round. Those months spent waiting in anticipation only make the first bite next year that much sweeter. (Although if you brush up on your food-preservation skills, you can enjoy a lot of that peak flavor throughout the year!) 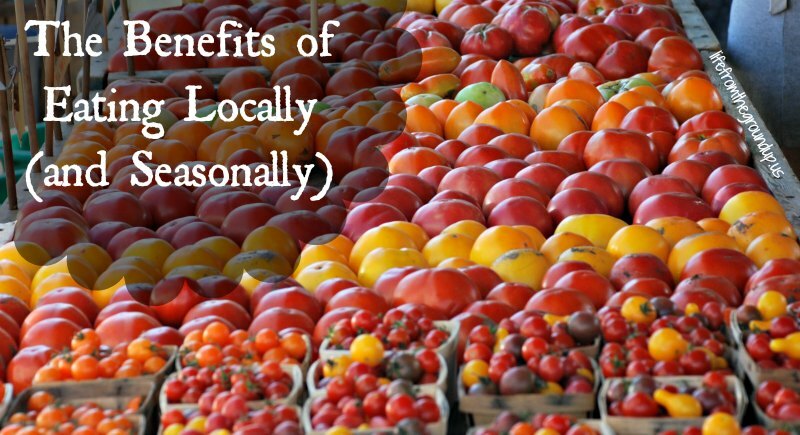 The benefits of eating locally far outweigh any drawbacks. It can get overwhelming if you let it, but don’t feel like you have to go all-or-nothing. We try to find local food sources as much as we can , but I have a special place in my belly for chocolate, and oranges, and Alaskan salmon, and pita chips, and a number of other things that we just can’t find in Ohio. The modern food system is amazing and we’re fortunate to have access to so much variety, but it’s also fragile. So get to know your local farmers. Start a garden (doesn’t get any more local than your backyard). Buy peak produce in bulk and learn how to can, dry, or freeze. And seriously, don’t ever buy those fake pink “tomatoes” again.